Derrick and I spent two weeks in the surfing paradise of Canggu, Bali, Indonesia. We visited during the “rainy season” with warm and sunny mornings followed by heavy afternoon showers. This allowed us to fill our days with early beach sessions and motorbike excursions before working away during the afternoon storms. It was truly our first “digital nomad” destination and we loved every minute it. 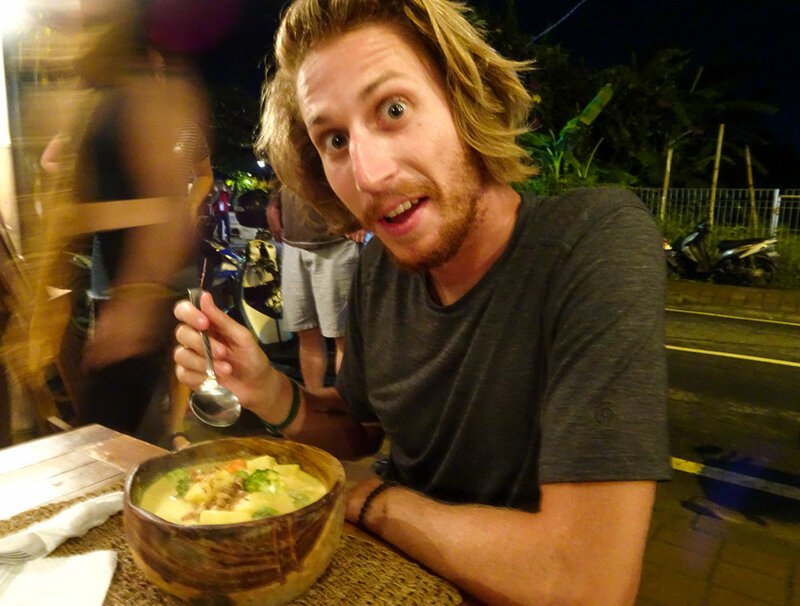 After two weeks, we were starting to feel like the rest of knowledgeable ex-pats and nomads who call Canggu home! Even though Canggu is considered a digital nomad hotspot, the area is still “up-and-coming” compared to its touristy neighbors, so we were pleasantly surprised by the number of restaurants, bars and activities it had to offer. Of course, the abundance of options made it extremely hard to narrow down our favorites. However, as we look back on our time in Canggu, there are places and experiences that definitely stood out! Smoothie Bowls, Avocado Toast, Warung Buffets, oh my! 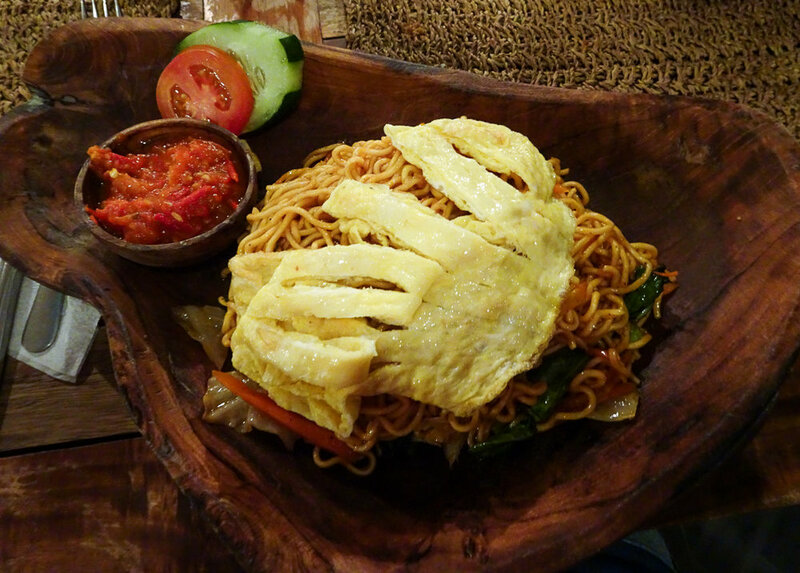 Eating well in Canggu is the easiest thing you’ll likely do while visiting. We’re still struggling to choose our favorites, but we’ve listed a few highlights we think you should try! Arguably one of the most popular breakfast spots in Canggu, Crate Café has a great reputation with the ex-pat and digital nomad community alike. This open-air restaurant offers a healthy and affordable menu that can make even the pickiest of eaters happy. We ate there twice which is saying a lot considering we always on the hunt for new spots. Head here for cheap roti in both savory and sweet selections. If you’re wondering what a roti is, then you’re sorely missing out. Kidding, roti is a crepe stuffed with just about anything you can think of (but not all at once). Our favorite was the breakfast roti with egg and vegetable/meat - the perfect pre-surf sustenance. We happened to visit Canggu over Thanksgiving and stumbled upon Goodwood Restaurant for their American-style Thanksgiving menu on offer. We may be bias, but the meal was delicious. 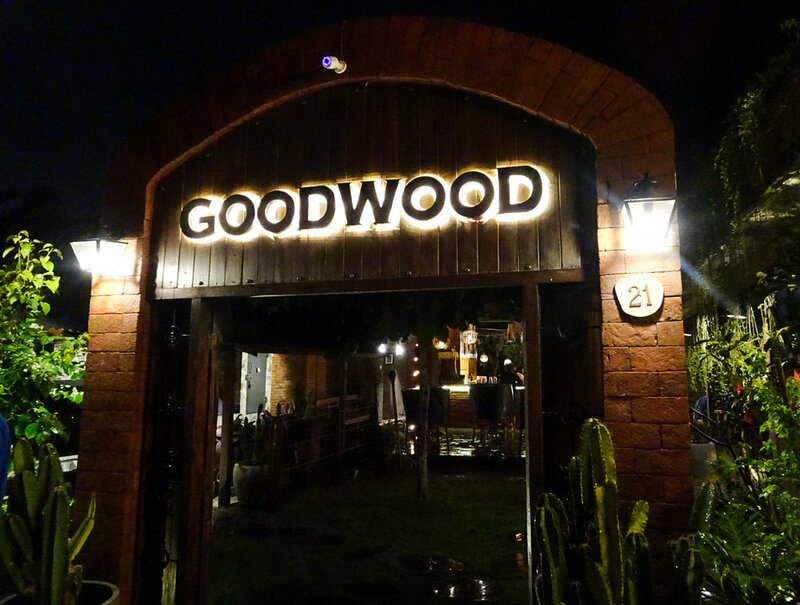 On a regular day, Goodwood is a smokehouse with plenty of delicious meats to choose from. The turkey was killer and we assume the rest of their menu would be too. Go here for a fancier dinner that won’t break the bank. Described on their website as a “tropical garden food court,” Berawa’s has something for everyone. While it’s better than most food courts we’ve been to, it does provide the same multiple-option-style setting which caters to every taste. The open-air seating area is surrounded by various mini-kitchens that serve everything from Balinese-style options to Mexican food and even French inspired cuisine. With a full bar and live music almost every night, it was the perfect dinner-time hang out. This is a hidden gem among the many Warungs in Canggu. A Warung is basically a small, family-owned restaurant in Indonesia that offers some of the best local cuisine you can get. We stumbled on Ithaka Warung while browsing our options and were blown away by the affordable price and delicious food. Bonus, they serve everything in hand-carved wooden dishes which is a pretty badass way to eat dinner. This restaurant tops every tourist and local’s list both for the ambiance and the food. We celebrated our last night in Canggu at this lovely restaurant and even enjoyed our first craft beer since leaving North America! The service was great, the food was wonderful, and the price was reasonable. If you are in Canggu, this is a staple. If you’re looking for a party scene, you may be better suited for the tourism hot spots like Kuta or Seminyak (south of Canggu). However, this surfer’s paradise does offer a handful of fun spots once the sun goes down and our favorites are listed below. Anyone who’s been to Canggu knows Old Man’s is “where it’s at.” A surfer’s hotspot by day, Old Man’s transforms into the local watering hole after sunset with themed-music each night and plenty of drinks specials and activities on offer. Our favorite was “Dirty ol’ Wednesdays” which is the famous party night at Old Man’s including a beer pong tournament and 2-for-1 drink specials. 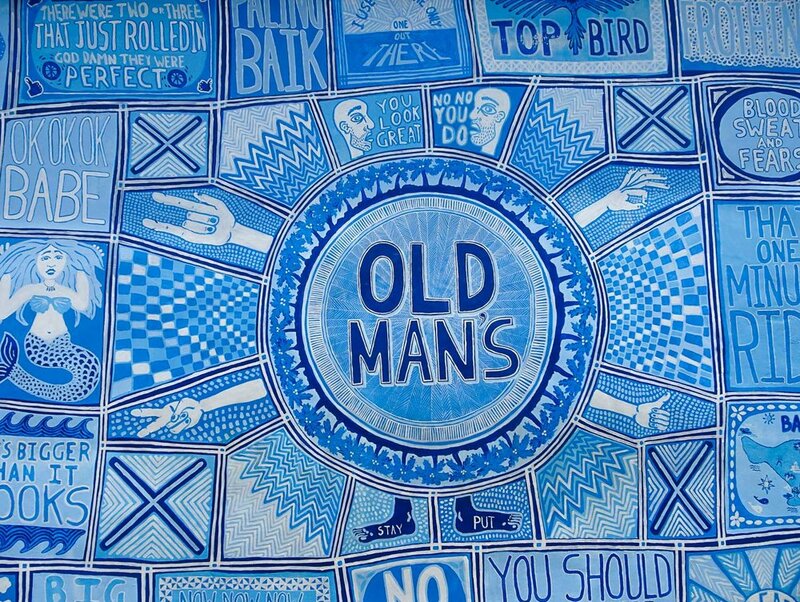 If you visit Canggu and don’t party at Old Man’s, did you really visit Canggu? La Brisa may be more of a Happy Hour romp than a late-night party scene, but the setting alone makes it worth a visit. Grab a couple of Bintangs, relax on the bean bags or around the pool, and watch the skilled Echo Beach surfers hang ten at sunset. Bonus, you’ll be surrounded by some of the trendiest “rustic-nautical” décor imaginable, which is so very Canggu of you. Canggu is known as the surfer’s hotspot and with good reason! While only three beaches are technically located in Canggu, each offers something different for the surfers and beach goers. 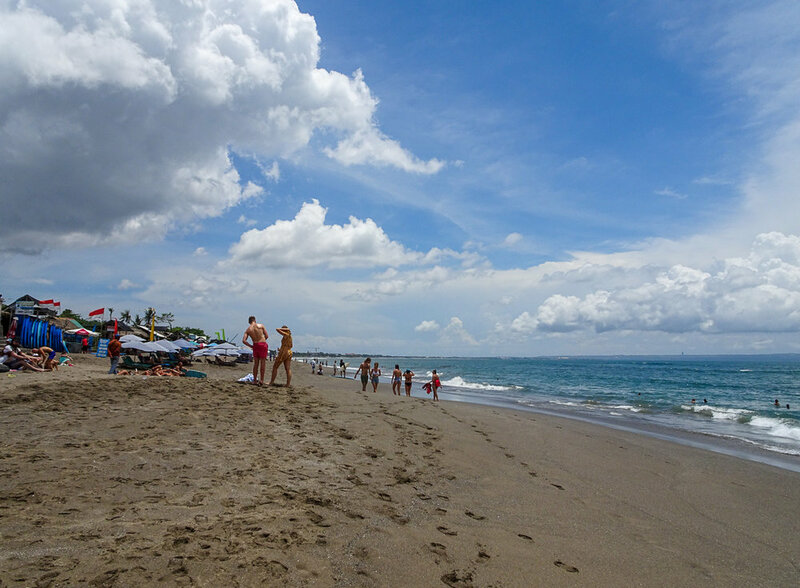 Canggu’s main beach is known as Batu Bolong and is basically Old Man’s backyard. Batu Bolong offers plenty of waves for the novice to intermediate surfers and is the best spot to take surf lessons with the rad locals. Be warned, even though there’s plenty of lounge chairs for sun-bathing, swimming at Batu Bolong is an adventure with gigantic waves crashing the shore every few minutes. One of our favorite activities was watching people get absolutely crushed by waves as they tried to swim or paddle out to surf. I know, I know, we’re evil. Derrick stood up on his first lesson! 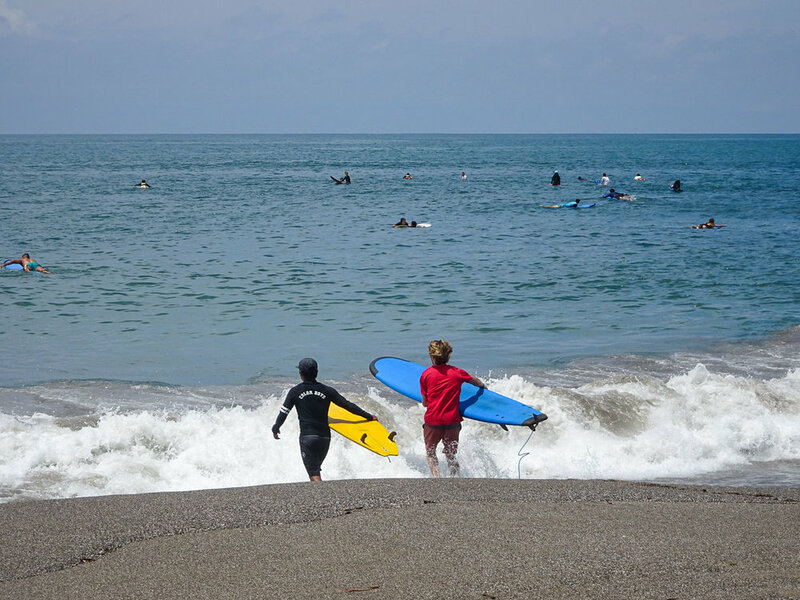 This beach is located to the south of Batu Bolong and is best for the novice surfers and the beach-goers. Berawa has plenty of lounge chairs for rent (100 rupee or $3 USD) and it’s a lot easier to swim here with the shallow surf and less frequent waves. If you’ve never surfed before, Berawa is a great place to start. Known as “the local’s beach,” this rockier coastline is perfect for the advanced surfers in the mix. Echo Beach also offers lounge chairs, and even bean bags, but staying out of the way of the surfers is the challenge for swimmers here. Full disclosure: we only stayed at one place throughout our two weeks in Canggu but we truly wouldn’t have chosen anywhere else. It was the perfect accommodation for our needs and the owner was one of our favorite locals that we met in Bali! 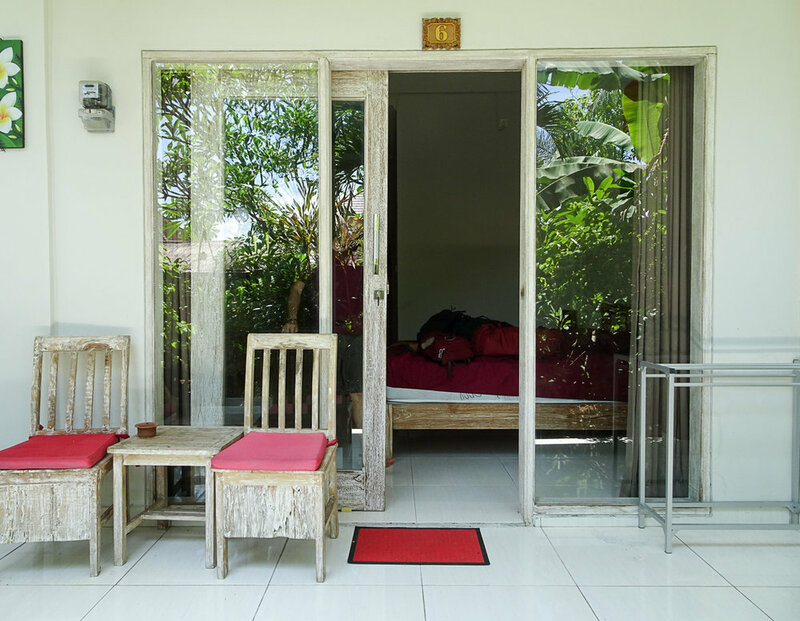 If you’re planning a stay in Canggu, look no further than Guest House Home 46! This Guest House is family-owned and operated by Komang, the most helpful and friendly host you’ll ever meet. Our room met all our basic needs including fast wifi, air con, hot shower, and even a small kitchen area for quick meals. The best part were the various amenities available such as two amazing pools and the common spaces for guests. The location may be the only flaw if you’re hoping to walk everywhere in Canggu (impossible as it’s so spread out but you could choose stay closer to the “main” downtown area). However, Komang offers motorbikes for rent and you can easily get into town, to the beaches, and to the restaurants/nightlife in minutes. Derrick and I with Komang! One of the gorgeous pools! If we’re being honest, we had very little desire to leave Canggu. However, there are plenty of great attractions within a short distance from Canggu (by motorbike), so we thought we’d list a few of our favorites. This seaside Hindu Temple is the perfect day trip for anyone looking for a more local experience. While it’s still very popular with tourists, the massive grounds do make for a peaceful stroll among the gardens and above the towering sea cliffs. We recommend visiting at high tide when the Tanah Lot Temple can only be viewed from the shore and looks as though it has washed out to sea. You can read more about our trip to Tanah Lot Temple here. Get your fresh seafood fix and eat like a true local at this amazing fish market. Jimbaran is south of Kuta (where the airport is located) so the drive from Canggu can be 45 minutes to an hour depending on traffic. However, it’s easy to reach by motorbike and the fresh fish is some of the best we’ve had. 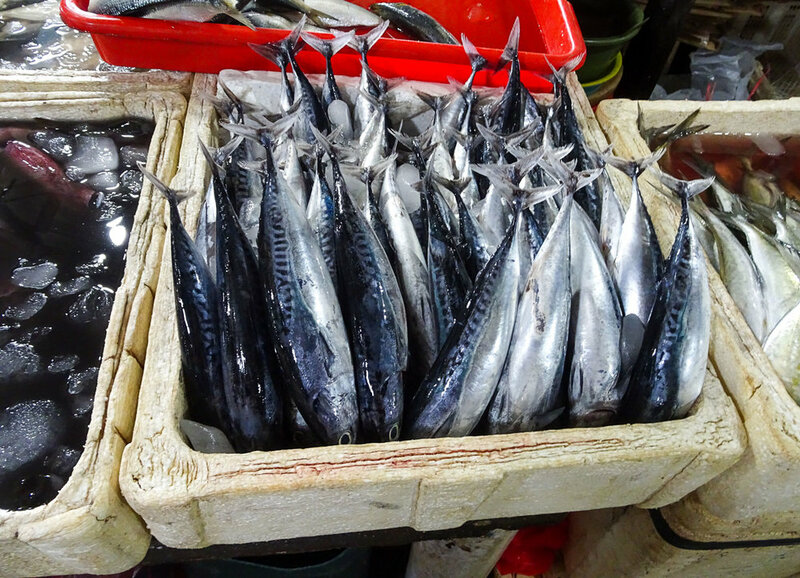 You can read more about our Jimbaran Fish Market experience here. Known by Canggu locals as “Semin-yuck” this built-up tourist spot is not for the faint of heart. After over a week in Canggu, we arrived to Seminyak and almost immediately wanted to leave. However, we ate a quick lunch and walked on the beach, which helped us find some of the charm that made it so popular in the first place. Seminyak is definitely not for everyone, but a quick drive from Canggu will give you even more shopping and dining options, and far more nightlife to choose from. You could spend months in Canggu and still have plenty of places to eat and things to do. This list is by no means exhaustive, but we do believe it covers all the Canggu staples and offers a variety of things to do outside of surfing and sunbathing. 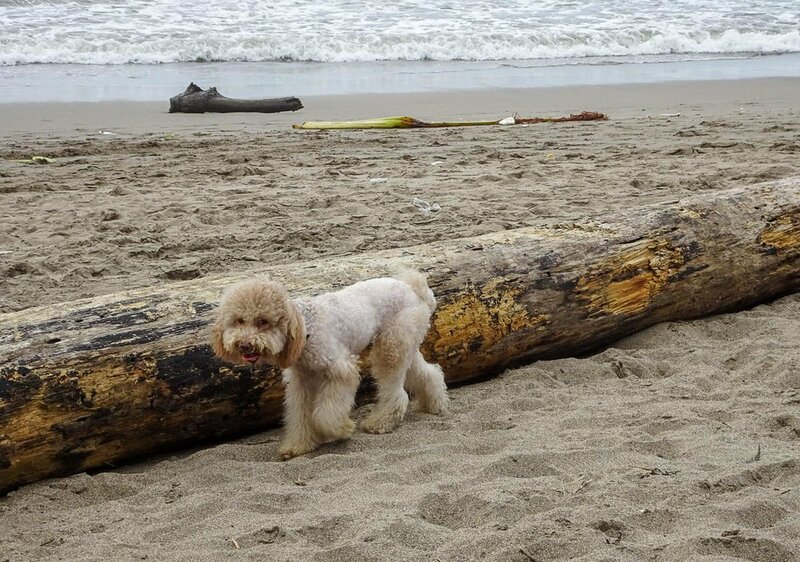 We hope you enjoy this hipster/hippie/digital nomad/surfer hotspot as much as we did!